*Note: This post contains affiliate links which means I receive a small commission if you make a purchase using this link. 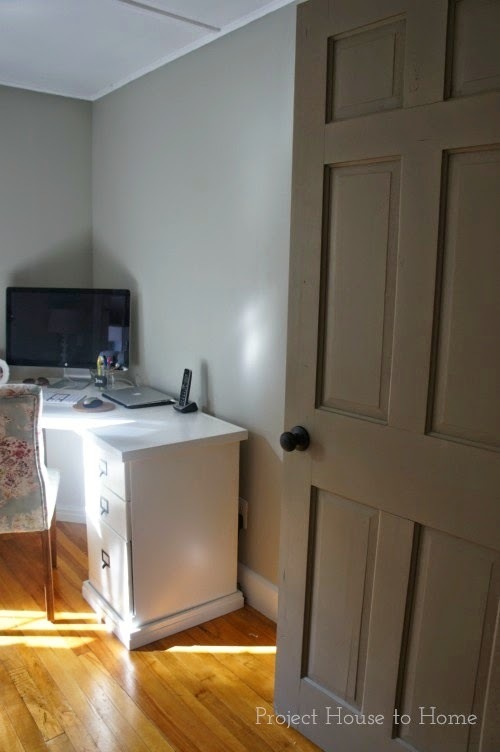 As promised, here's part deux of our home office/mudroom updates. Catch up on part one here. So I mentioned that I painted the walls Brushed Aluminum by Benjamin Moore. I would describe the color as a greige with a green tint to it. It's a lot like "Night Mist" by Benjamin Moore that I used to paint the living room, except not as green. It's a good neutral. I took down the closet door and hung a curtain I had on hand. I have plans to do some open shelving, but for now the curtain hides the scary mess. The artwork and basket are from Target, and the bench is from HomeGoods. The rug is the Tricia Trellis Indoor/Outdoor Rug from Ballard Designs. Since we'll use this as our main entrance, I needed a place to wipe our feet but didn't want to give up beauty for function. Indoor/Outdoor rugs work great! They stand up to stains really well and are easy to clean. You can even hose them off if you need to. I wanted a slightly larger desk than I had before and something with lots of storage. 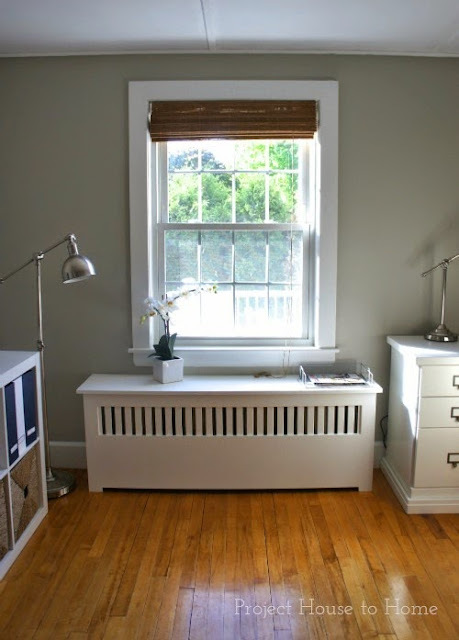 I had my eyes on the Pottery Barn Bedford Corner Desk for some time. Fortunately for my wallet, the dimensions were not right. 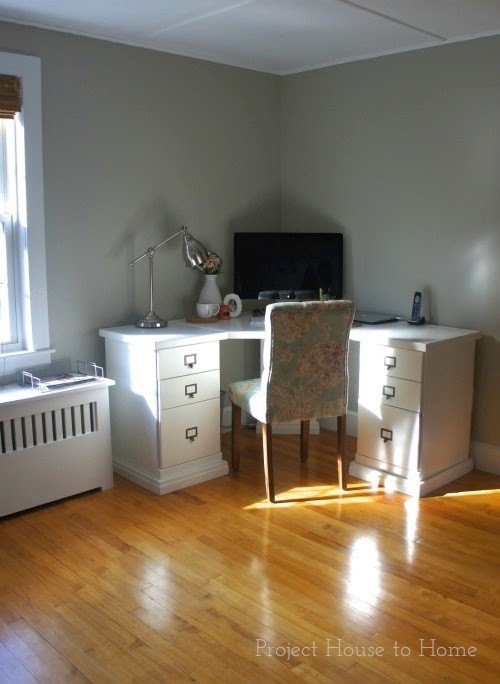 I ended up buying the Original Home Office Corner Desk from Ballard Designs. Still not cheap but I caught them on a 20% off sale which made it a bit more palatable. I really do love the desk! Some time here I will get around to adding some shelving and art above the desk. Did you notice my pretty chair? 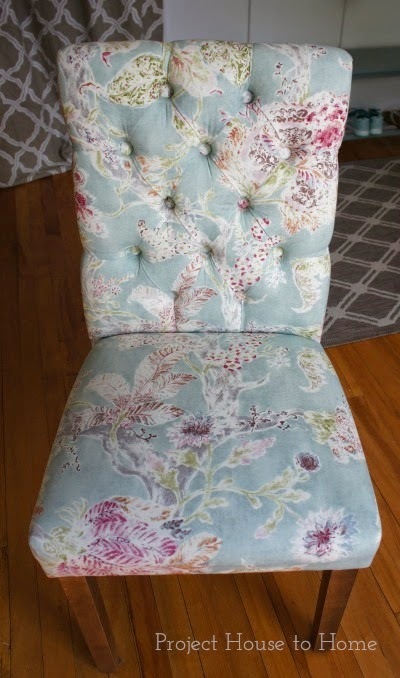 It's the Threshold Brookline Tufted Chair from Target. I will admit the quality is not great (legs get wobbly and need to be tightened), but I love the pattern. I ordered the radiator cover from Finchman. See my living room post for source. It's nice because I can use it as a shelf too. I hung a bamboo shade but would love to get some other window treatments up at some point (haven't decided what yet). The other side of the room is still pretty neglected. 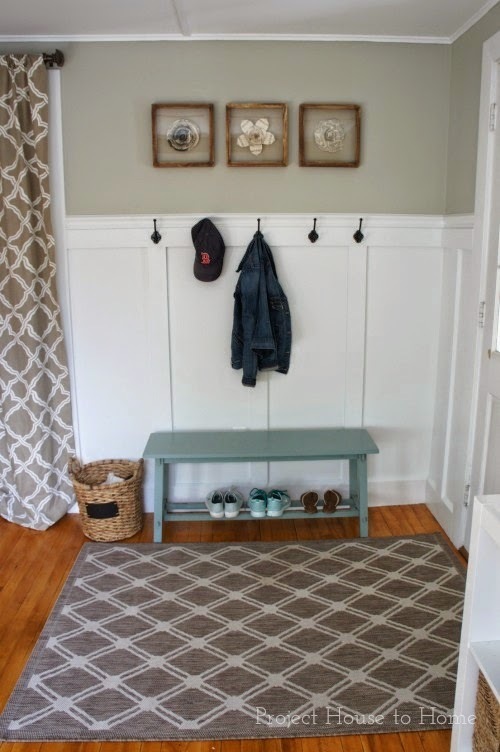 We have plans to add the same board and batten treatment along this wall and I would love to do a built-in bench. I painted all of the downstairs doors a taupe color, Raccoon Hollow by Benjamin Moore. All the doors downstairs are pretty beat (I'm thinking they're original to the house), but I kind of like all of their imperfections. I have some other completed projects to share (in due time)..two posts in one week...I mean, I'm killing it. Love your new office furniture. The room is looking good! !